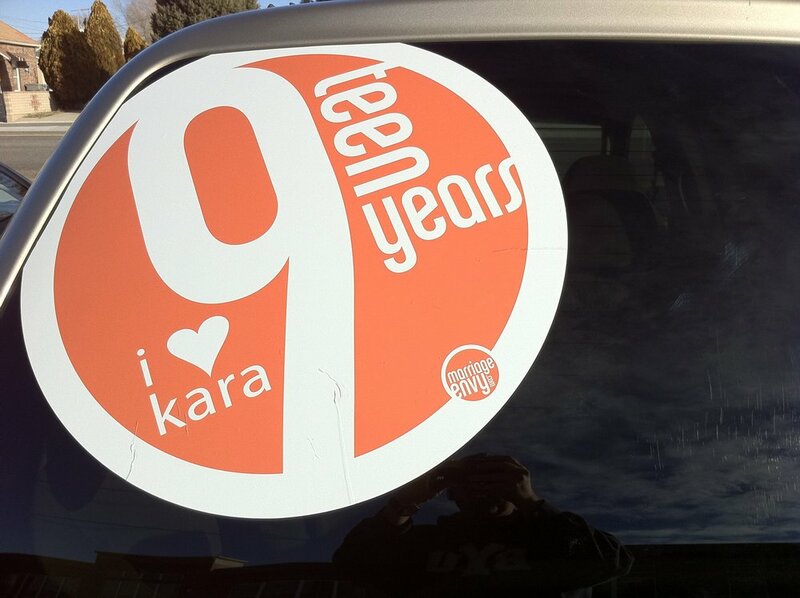 For the past several years, I've created for Kara what I call an Anniversary Logo that I plaster all over the car, our house, and I usually combine it with some public spectacle at her workplace. Personally and professionally, I preach and practice what I call "relationship marketing" which is all about courting, wooing and winning your partner all over again on a daily, regular basis. The marketing principles that Coke, Apple, and Nike are clear and compelling and keep them continually at the top of their game. Why? Because they are 100% clear that they will do whatever it takes to win you to them—not just once, but again and again. Is your message to your spouse that clear? Unfortunately, most relationships did this marketing (aka courting/dating) in the early phases of the relationship, but haven't for years or do it sporadically. And then they wonder why they "lost" the spark. Marketing and customer loyalty doesn't take care of it self—it must be created, and re-created continually. It's not much different in marriage, folks. 2. Is that message of love communicated daily and relentlessly to him/her?